Weight First! - Very popular gainer in the US, contains the most refined and thought-active ingredients which have impact on the price, but the fans of this product are not looking any further! 175 loyalty points Your cart will total 175 points that can be converted into a voucher of 7,00 PLN. 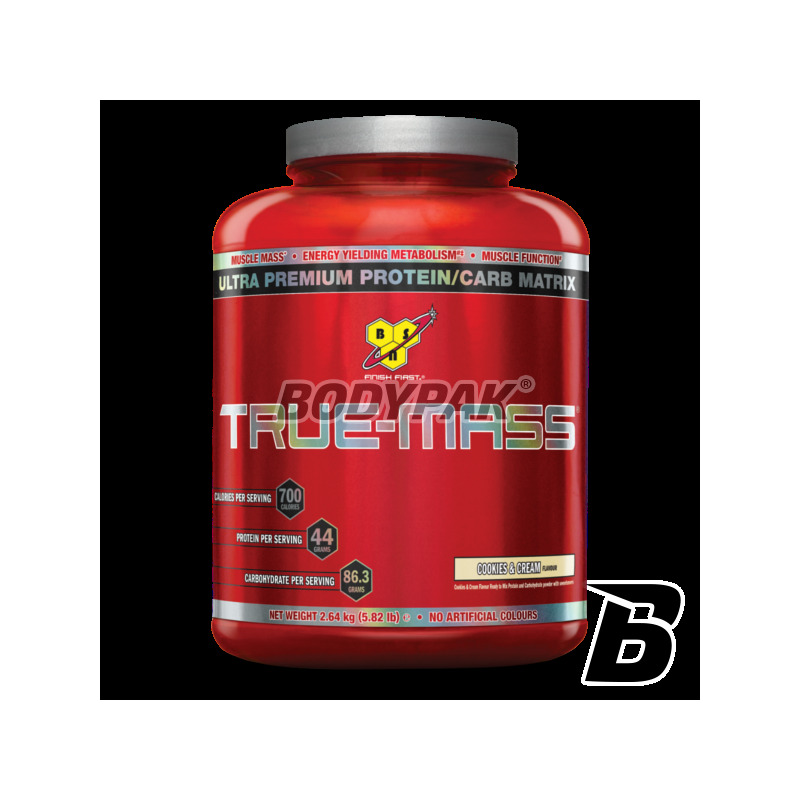 BSN True Mass - is a high-quality nutritional carbohydrate-protein created in order to maximize support the anabolic processes (m.in . : leading to the growth of muscle tissue). Consumed during the day helps prevent catabolism (muscle breakdown) associated with lack of food, provides a high level of energy and reduces the feeling of hunger. In the post-training, however, it supports the regenerative processes and helps to rebuild depleted glycogen stores. Ultra-filtered whey protein concentrate - very easily absorbed - absorbed from the gastrointestinal tract in only a few minutes, has a broad amino acid profile, high biological value BV = 104, rich in alpha-lactalbumin. Casein Micellar Alpha and Beta-type and Caseinates - are characterized by a very long digestion time so help stop catabolism for hours. Dymatize Whey protein isolate - absorption time of a few minutes, the highest biological value BV = 159, ideal when you need virtually instantaneous supply of amino acids for our body. Calcium caseinate - characterized by the most uniform release of amino acids into the blood stream from all protein sources, including the best for the long gaps between meals. Milk Protein Concentrate - all the best of milk without undue lactose, cholesterol and saturated fatty acids. Contains conjugated linoleic acid (CLA), glutamine peptides or are lactoferrin (preferably absorbed iron has a strong antibacterial properties). With this mix, we are sure that consuming True-Mass we supply our body with all the necessary amino acids, for several hours, and not only a few minutes. Appropriately chosen blend of carbohydrates - both help in the rapid addition of glycogen after training, as well as supplying energy needed during the day. Glutamine Peptides - an excellent source of glutamine, thereby strengthening the immune system, accelerating regeneration, anti-catabolism. Fiber - regulates the metabolism and contributes to the sense of full - which helps to limit food intake. Digestive enzymes - helps you make better use of proteins. MCT and essential fatty acids - healthy fats needed for proper functioning of our body. MCT oil is an excellent and easily accessible source of energy. 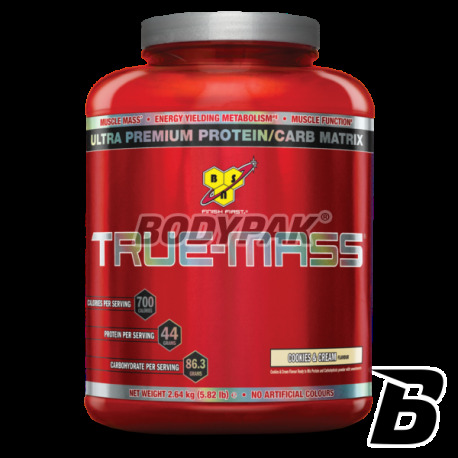 So you see the full composition of the True-Mass ensures that each batch will find everything you need physically active person! Ingredients: Matrix protein (ultra-filtered whey protein concentrate, casein micellar alpha and beta caseinates Dymatize whey protein isolate, egg albumin, calcium caseinate, milk protein concentrate ), modified glucose polymers (Maltodextrin ), cocoa, flour, sunflower, natural and artificial flavors, cellulose gum, gum Xanthe, gaur gum, gum acadia, sweeteners: sucralose, acesulfame potassium; Lecithin ( soy ), digestive enzymes (papain and AMINOGEN). Na masę w sam raz, smak rewelka - opinie faceta :). Stosuję na masie i polecam. Jako uzupełnienie ok, jako zastępczy posiłek - jak kto lubi. MASA MASA .. świetne uzupełnienie diety.. tego właśnie potrzebowałem! Wyniki są po nim OK. Nie brałem wcześniej kupnego gainer-a także nie mam z czym porównać. Dość trudno się go miesza w shakerze, zostają czasami grudki i trzeba mieszać raz jeszcze. Smak ciastko z kremem jest dla mnie za słodki.